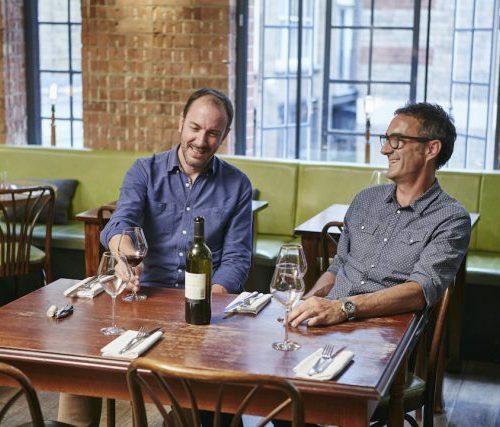 Brett Woonton (right in picture) and Charlie Young burst onto London’s dining scene as a double act in 2005 when they launched Vinoteca, the first of a five-strong group of wine bars, in Farringdon. But both are old hands in the trade, having met while working for Liberty Wines in the UK. Woonton’s decade of experience working for the likes of Enotria Wine Cellars and Liberty Wines has provided him with enviable experience of the British wine trade, with a particular focus on Italian expressions. His New Zealand roots mean their drinks list has a strong showing of New World bottles. Young, meanwhile, comes from the world of hospitality, with experience working in London, the Channel Islands, the West Indies, Germany, France and Australia. Woonton says his love of wine came at an early stage in his hospitality training at a hotel. “The sommelier’s enthusiasm for the subject really inspired me,” he says. The pair know a thing or two about getting on the same wavelength as their customers, and know how to shift the more off-beat wines they sell. “People are a lot more adventurous, and are interested in wines with really good back stories. They are tending to trade up on wines now, and they want to be educated in entertaining and interesting ways,” says Woonton. Vinoteca bars now hold regular horizontal tastings on everything from English sparkling wine to organic production. Woonton’s favourite part of the job is running the “massive tastings” he and Charlie organise twice a year. They educate their customers to make sure they’re right at the forefront of the latest trends. Education is a key part of Woonton and Young’s business, with Woonton telling us that he’s still constantly learning every day. “It’s actually very hard work in regards to creating a new wine list, tasting wines and presenting them in an easy-to-understand but exciting way to customers.” Nevertheless, it’s a labour of love for the pair.